Wodcat is a new free service for crossfitters all over the world. Now you can get more useful information, besides time of your performance, for analaysis and building balanced training programs, statistics, progressions and planning in crossfit training (WOD).. Statistics, progress, analysis and planning. The dashboard displays all important information, statistics on completed workouts, a chronology of changes in body measurements and an overall physical condition level. WOD catalogue with the most user-friendly and detailed search engine. You can compare yourself with the whole world. Besides training and recording the results, now you can compete with your friends from your box, city or country. Handy and user-friendly tool to plan your WODs. Now you can organize your training plan easily, and have a handy WOD diary. Calendar is a convenient and user-friendly tool for programming the training. 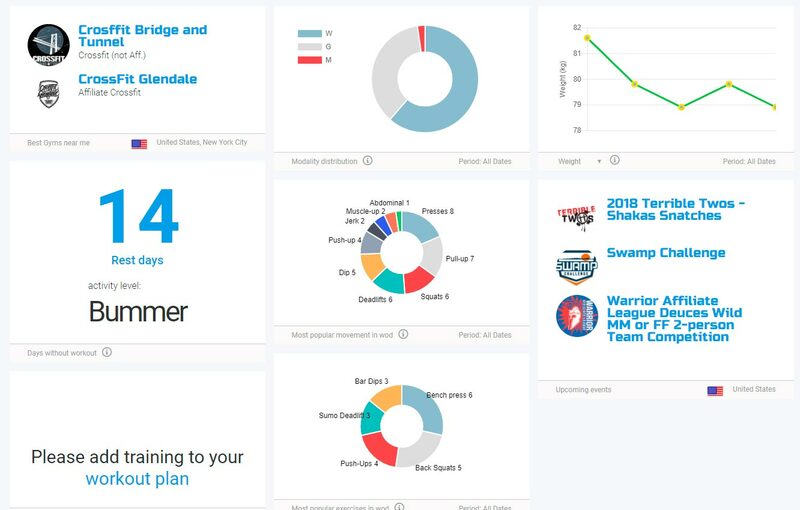 Now you can simply and easily plan your training program with a very convenient training journal. Copyright © 2018 WodCat. All rights reserved.